Quiche may seem like a decadent breakfast or dinner, but this version is almost guilt free. It’s loaded with fresh summer veggies. I suppose if you were really watching your weight, you could try eliminating the crust, but the crust is my favorite part of a pie. It’s time again for the Secret Recipe Club. 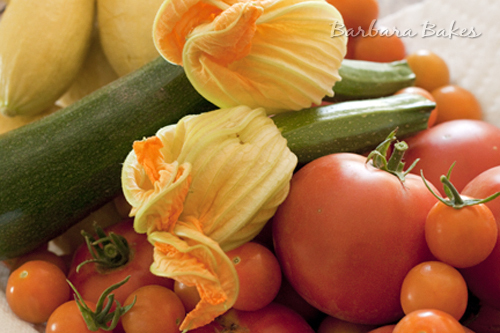 Amanda, at Dancing Veggies, is my secret blogger for the month. 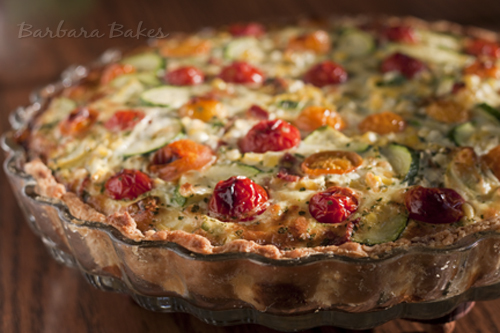 Amanda’s post Truly Scrumptious caught my eye – a scrumptious Farmers’ Market Quiche. Dancing Veggies is loaded with great, healthy veggie recipes and I definitely need to visit more often. Darlene also sent me home with some sweet little orange cherry tomatoes. 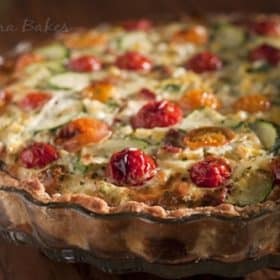 I already had some grape tomatoes, so I decided to use them both and sprinkle them on top of the quiche. The tomatoes were a great addition. They roasted in the oven and gave a wonderful sweetness to the quiche. I made a couple of other changes too. I used green onions instead of red onion, freeze dried cilantro instead of fresh, and I couldn’t resist adding a little bacon and doubling the cheese. I would have liked to have had a slice for breakfast the next day, but there wasn’t any leftovers. 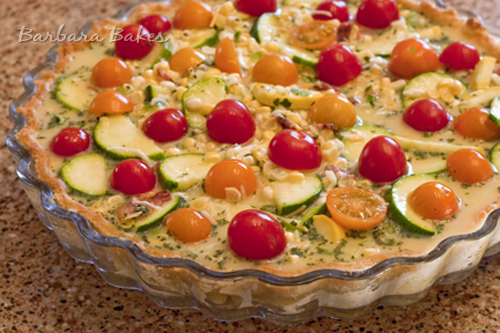 Thanks Amanada for sharing your scrumptious quiche recipe. Preheat oven to 425º. Press crust into a 9 in quiche pan, prick crust and bake for 15 minutes. Place cut zucchini in a strainer and sprinkle with 1/4 teaspoon salt. Let sit for 15 minutes to remove some of the water. In a large bowl whisk together the eggs and milk. Add the zucchini, bacon, green onion, corn, cheese, cilantro, salt and pepper and mix well. Pour the egg mixture into the precooked crust. Sprinkle the tomatoes on top of the egg mixture. Bake for 30 minutes until the center is set and a toothpick comes out clean. Allow to cool slightly before serving. Each month the Secret Recipe Club members are “assigned” a participating food blogger. We choose any recipe from the assigned blog to bake/cook from, and blog about the recipe keeping the blogger a secret until posting day.